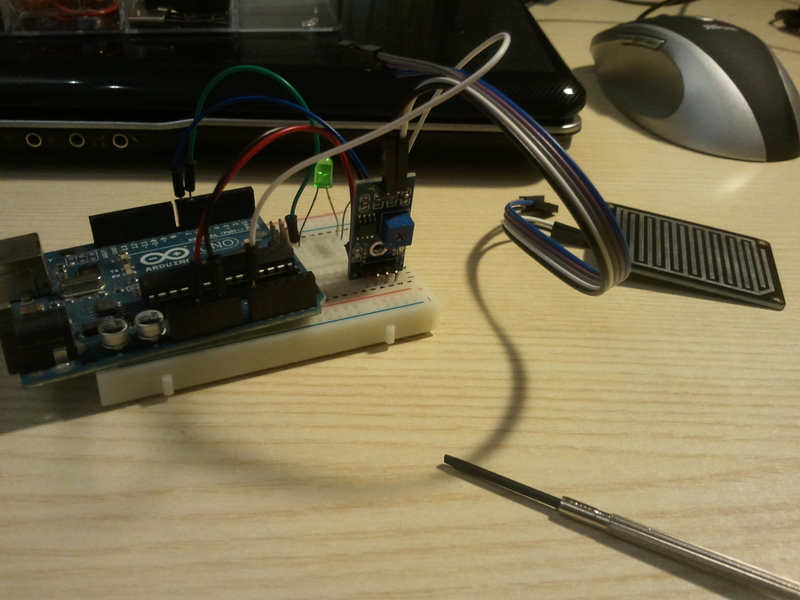 This post is part of a series where I develop C programs for my Arduino Uno. This time I wanted to interface with a rain sensor. Transmit to a PC serial port terminal with the USART, and visualize the analog signal level. The first step was actually to identify the rain sensor, because I don’t know its origins except for the fact that it has some letters and Chinese characters etched on it. The sensor is a resistive dipole that shows less resistance when wet and more resistance when dry. There is a resistive divider that outputs a lower voltage when the sensor is wet and a higher voltage when the sensor is dry. This voltage (AC) represents the humidity level. The humidity level is compared with a reference voltage (IN) with a saturating op-amp that outputs a “digital” signal (OUT) that is high (VCC) when the sensor is dry and low (GND) when the sensor is wet. The reference voltage (IN) can be trimmed with a potentiometer. 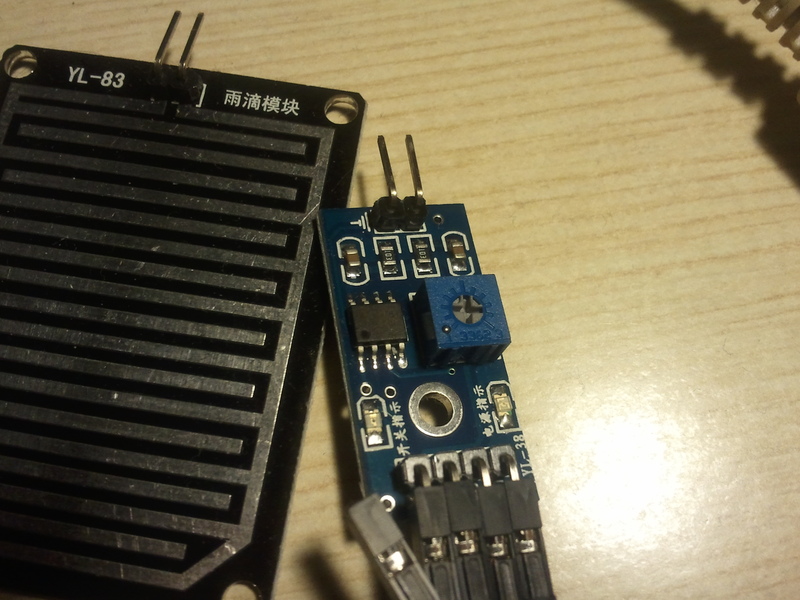 The 4-pin connector is used to power the module with VCC (5V) and GND signals, and to retrieve “analog” humidity level (AC) and “digital” rain indicator (OUT). There is a blue LED (D1) that indicates that the module is powered, and a red LED (D2) that is lit when it rains (when OUT is low). AC to pin A0, which is PC0(ADC0) of the ATMega chip. I also placed a LED on pin 6 which is ATMega PD6(OC0A) to be able to visualize AC level with PWM. The ATMega has an ADC that can be configured to read one of the chip pins, in our case ADC0, and convert it into a 10-bit value. The value is presented in two 8-bit registers containing the low part (ADCL) and the high part (ADCH) of the 10-bit value. In my case I decided that 8 bits should be more than enough, so I configure the ADC so that 8 bits are in the high register ADCH and 2 bits are in the low register ADCL, and I read only ADCH. Since timing is not a problem, I decide to simplify the management of the conversion and do a “blocking” read where I start the conversion and wait the result with a loop. The reference voltage for the ADC is AVCC, that in the Arduino Uno board is connected to 5V. In this way I can read the AC signal from the rain module from the ADCH register, as a value from 0 to 255 (0xFF). The OUT rain signal instead can be read from PIND7 bit of the PIND register directly as a 1 or 0. Note: I created a macro called BVV to simplify writing whole registers with a chain of bitwise OR operators “|“. I attached a green LED to pin 6 (PD6/OC0A) with a resistance in series; I chose that pin because it offers functionalities related to ATMega Timer/Counter0, in particular it can do Pulse Width Modulation (PWM). In brief, it can generate on pin OC0A a square wave with a chosen duty cycle, and the more the duty cycle is close to 100% the more the LED is lit. The duty cycle is configured using the OCR0A (Output Compare Register of timer 0, unit A) 8-bit register, from 0 (0% duty cycle) to 255 (100% duty cycle). In my application I can transfer directly the value read from ADC0 to OCR0A. The frequency of the square wave is not very important, but I chose a lower frequency (by configuring a high prescaler) so that the voltage has time to rise and fall, in case there are relevant capacitances in the circuit. Now I have all the functions to interface with the hardware, I need to glue them together. I want to visualize the rain sensor data both on the LED and on the serial port. On the LED I simply want it to be brighter when the sensor is more wet, so it’s simply a matter to transfer the humidity level to the duty cycle of the PWM. On the serial port I decided to visualize the level with a “gauge” that shows the rain indicator (0: no rain, 1: rain), a bar that is more full with raising humidity, and an hexadecimal (because it’s easier to program) value of the humidity level. The string containing the gauge has a carriage return character ‘\r‘ that goes back to the beginning of line without moving down to the next line, so that the line updates itself. The effect is shown in the screenshot below. The main function is simply a loop that reads the values from the sensor and outputs them on the LED and serial port, with a small delay. All the code that I have shown above is collected in “rain.c” source file, that is also available on Github. I can try the sensor by sprinkling some water drops on the grill, or by placing my fingers on it. 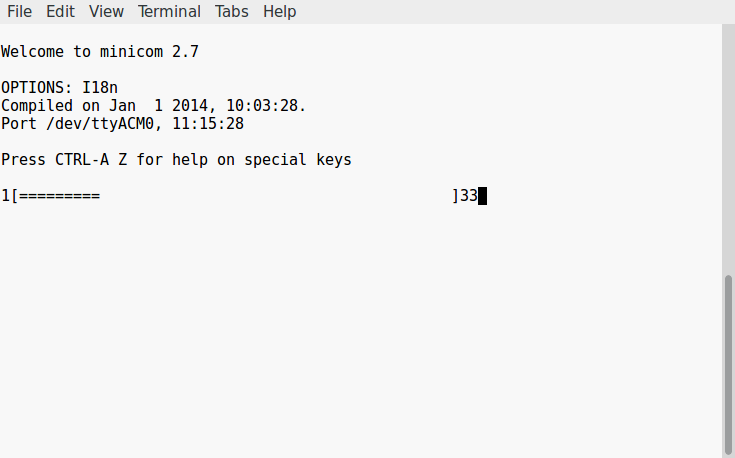 Be aware that the serial is also used to upload, so you need to exit from minicom before flashing a new program. 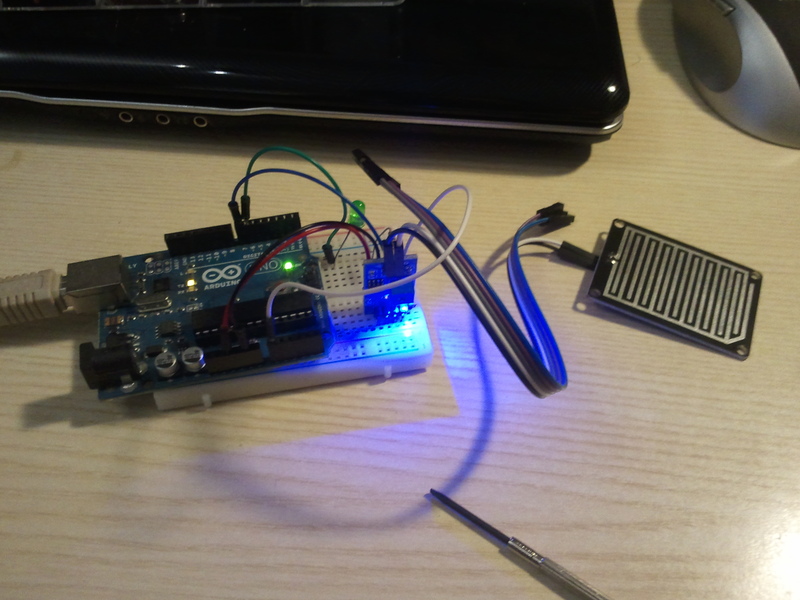 In this post I have shown how to use together some functionalities of the ATMega chip in C; the occasion was to play with a rain sensor and its outputs. The program size is less than 600 Bytes, which shows an advantage of using C, especially when program size and speed become a blocking problem. What is your advice on the yl-83 ? It is ok for rain sensor ? I think it’s made to answer the question “is it raining?” with a yes or no. My impression is that it would be difficult to use it as a fine grain humidity sensor. One would have to characterize the sensor by measuring the resistance of the plate with various humidity levels, and I suspect that the resulting plot won’t be a nice line. Maybe it is, I don’t know, but it’s not quick or easy to find out if it is. I don’t have much free time, so if you have a specific question about something similar to what I did, then I might be able to answer you. hello, where can i get a Proteus library for this sensor ? I never heard of Proteus before, I see now that it’s a software for PCBs but I have no idea where to get libraries for components. It’s possible that you have to build one yourself. I am a little bit confuse with the project, does your rain sensor project requried the adruino connects to a computer (for the serial port), then reading results from computer serial port to output reading? Yes, you understood correctly that this demonstration assumes that the Arduino is connected to a PC. If you want to do a battery-powered sensor, it still has to communicate the reading to some other device/computer, or show it on a display. Thanks for your reply, do you know what other devices (beside computer) can be portable, will lcd display able to replace the serial port from computer and output the reading? An LCD shield (I would probably seek one with I2C interface) would be OK to show something like that. But you have to imagine how will you use the finished product. You can put it just outside a window, but it will be probably more useful if it tells you remotely if it rains, with something like Bluetooth or WiFi or by SMS. Or if it performs directly some actions like watering plants if it doesn’t rain. Anyway I can’t tell you what you want to do with it, you are the only one who can know.